Imagine there was a report that detailed how IoT is revolutionizing industrial manufacturing and could improve your digitization strategy. The wait is over. Here at T-Systems, we are proud to present the findings of CXP Group - a leading independent European research and advisory firm in the field of digital, software and IT services. 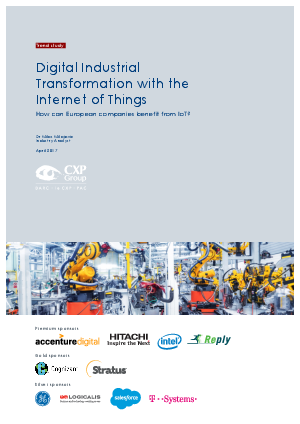 Their new “Digital Industrial Transformation with the Internet of Things” report examines the dynamic range of opportunities that IoT holds for businesses and explores the challenges of integrating existing data processes with those that are IoT enabled. The report is the result of the feedback cultivated from interviews with senior business and IT decision-makers responsible for creating and running innovation strategies at 250 large-scale European manufacturers. The data has been disseminated by region, strategies, pain points, IoT adoption, intention, investment etc. and provides readers with a detailed examination of what industrial businesses look for most from IoT.